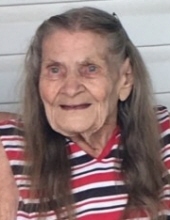 Mildred L. Shelton, age 92 of Brownstown passed away on Saturday, April 6, 2019 at Schneck Medical Center. Born December 28, 1926 in Seymour, she was the daughter of William and Goldie May (Young) Hamilton. She married Andrew Warren Shelton, who preceded her in death. Mildred was a homemaker and enjoyed working puzzles, reading, playing bingo, watching her soap operas and swinging on her porch. Survivors include her children, Billy Joe (Ivy) Hamilton of Seymour, Pete Shelton and Dale (Penny) Shelton both of Brownstown; grandchildren, Tammy (Jerry) Hendershot, Terry (Sandy) Hamilton, Brian Hamilton, Gary Hamilton, Tiffany (Joe Adkins) Shelton, Jason (Beverly Lane) Shelton, Lora (Jeff) Sitterding and Heidi (Wayne) Caffee. Mildred also leaves behind 11 great grandchildren and 13 great-great grandchildren. She was preceded in death by her parents; husband; siblings, Cleve, Nella Rose, Mabel, Leo, William Jr., Floyd, Ruby; and a great-granddaughter. To send flowers or a remembrance gift to the family of Mildred L. Shelton, please visit our Tribute Store. "Email Address" would like to share the life celebration of Mildred L. Shelton. Click on the "link" to go to share a favorite memory or leave a condolence message for the family.